The event had to be rescheduled after complaints made to the original venue because of the minister’s role in the Repeal campaign. 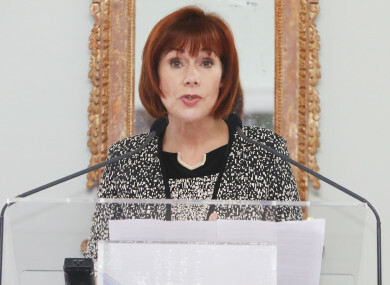 MINISTER FOR CULTURE Josepha Madigan has said the inclusion of women in the priesthood should no longer be considered “a taboo topic” in the Catholic Church. The minister delivered a speech yesterday evening at an event that originally had to be rescheduled due to threats related to her involvement. Madigan was due to speak at the event at the Mercy International Centre, organised by We Are Church Ireland, in January but the group said last month that it would have to change the venue due to a number of complaints, and a small number of threats to the venue. Her speech was entitled ‘Why the Catholic Church should open all ministries to women’. The group said the protestors focused on the role the minister played as coordinator of the Repeal the Eighth Amendment campaign in May last year. The Mercy International Association withdrew the venue due to the complaints. “Threats have been made of busloads of protesters being brought to the site and two parishes have indicated that they speak on behalf of parishioners,” the CEO of association Sister Mary Reynolds said at the time. A new date of 11 February was set at a different venue and the speech, with the title unchanged, was distributed to the media yesterday evening by Fine Gael’s press office. The minister began her address with a reference to the time last June when she and two other women stepped in to lead prayers at her local church – an incident that made the headlines at the time and was the subject of criticism from Archbishop Diarmuid Martin . “It was a six o’clock Saturday mass. Just before the mass commenced the sacristan told us that there was no priest available and that we would have to step in. I felt it was important that those who had chosen to attend the church for Mass that evening could partake in prayers as a faith community, even if it was not in the way that they had expected. I believe the other two ladies were of the same view,” she said. The Catholic Church after all is a people’s church, and the community of faith is at its heart. What I did not expect, was the ensuing headlines, media comment, and reaction, to what was perceived in some quarters to be a controversial act. It was claimed that I had crossed a line. It was joked, or erroneously noted, that I had “said Mass”. Madigan said they had only done what many other women and men are doing around Ireland and their involvement was a reminder of the role of women in the Church Ministry in general. “I received letters, cards and emails from all around the country from Clare Island to Dublin where more women but some men told me of their daily, weekly and monthly involvement in assisting in their local parish church. The Church calls for us all to break bread together at Mass, and women are playing a role in Ministry and the liturgy at several levels across the country and the world. “The role of women in the priesthood is still considered a taboo topic at the highest levels of Catholic Church. She spoke of the “catastrophic moral failures” of the church in relation to sexual and physical abuse scandals and the denigration of marginalised people, which she said has shaken people’s faith. We have a responsibility to speak up for the values we expect our church to uphold. Irish public life in general has been well served by those who speak out against injustices, even when their actions are not appreciated or welcomed. The minister also pointed out that while the number of Catholics in the world has increased, the number of priests is dwindling and allowing women to step in would help to address shortages. “You can walk into any parish in this country and around the world – more often than not, it is women who are holding parishes together, doing the lion’s share of the work. According to the Vatican’s Pontifical Yearbook, 2017, women comprise a majority – 56% – of all consecrated people within the Church. So let’s be clear, women are in the Church. Women work for the Church. They simply face a glass ceiling that bars them from being able to apply for, or be appointed to, important leadership positions. And glass ceilings are being broken in many sectors, politics, science, so why not in the Church? “It is not that women need church leadership positions; it is that Church leadership needs women,” Madigan said. Email “Culture minister: 'Glass ceilings are being broken in many sectors - so why not in the Church?'”. Feedback on “Culture minister: 'Glass ceilings are being broken in many sectors - so why not in the Church? '”.